Due to fear of Tsunami, the beach as expected was empty; no tourists whatsoever & the few that visited were seen around the temple. Even the Scuba Diving shop was with no customers and it is quite obvious that no one would like to risk their lives in such a situation. Even few of my friends backed out last minute, however I had my colleague Guru Prasad and we both were escorted by the resort staff. We were quite determined & had made up our minds so as per our plan we went ahead to take a dive. 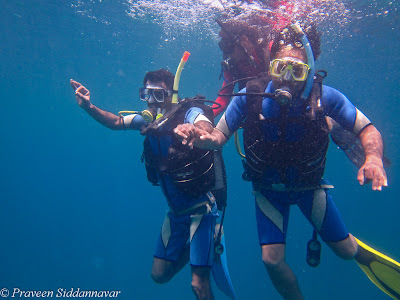 For both of us it was first time experience of Scuba dive. There are several formalities that we had to complete like our id proof, photo id and filling up some declaration forms. Once we had done our bit, the Scuba diving shop has to seek permission from the Police Dept, and this time the cops were reluctant to give permission. Our instructor Dhirendra Rawat called me and updated that it will take some time before he convinces and gets the permission, so he asked us to hang around for a while. 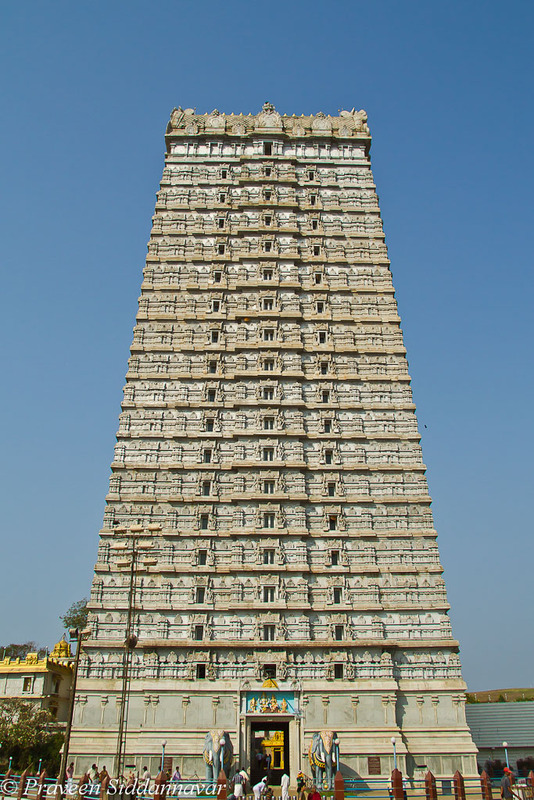 It was quite hot and humid, we decided to pay visit to the Murudeshwara temple which is located on the beach, and here we worship Lord Shiva. 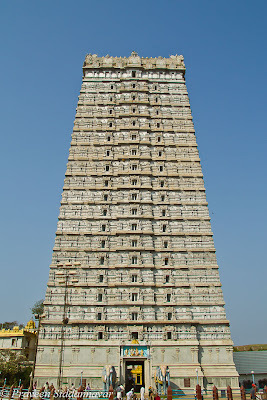 I took this opportunity to make few images of the temple. 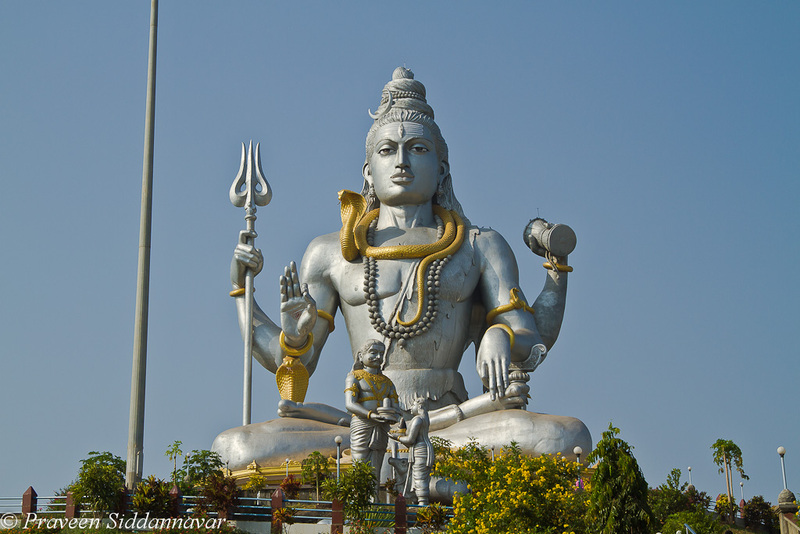 As we were getting out of the temple I got call from Dhitendra and the good news was that our permission to visit Netrani Islands and Scuba diving was granted. After waiting for an hour or so there was something to cheer, probably even GOD was with us to make this happen. Dhirendra arrived with our permission letters and we all boarded the motor boat to reach Netrani Island, the ride is ~ over an hour’s journey in the Arabian Sea. During the journey we were given complete briefing about do’s and don’ts, basics of Scuba diving and other precautions that one needs to take. After the briefing I wasn’t sure if I can really do it, breathing with oxygen apparatus under sea was something new and of course tricky, SCUBA acronym – Self Contained Underwater Breathing Apparatus. As we cruised towards Netrani Islands my heart beat increased, I was really nervous. I was asked to be ready with the scuba diving gear, quite a heavy oneJ. I thought I can take a normal jump into the sea but as per the guidelines one has to fall on his/her back into the sea. The first 15 minutes were tough and I was practicing the technique of breathing with the Oxygen apparatus. After a while we both were a bit comfortable and now we were ready to go. We had 2 instructors Dhirendra for me and Kishore for Guru. 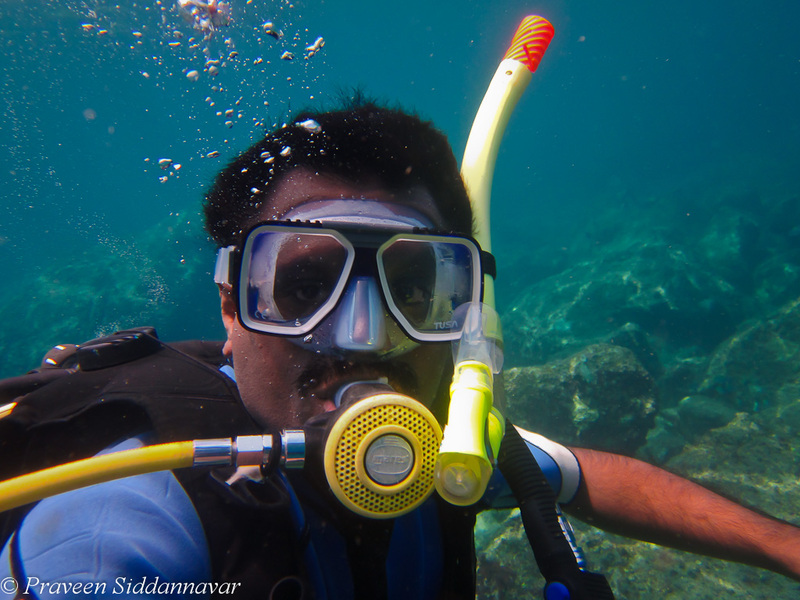 And now I was all set to explore the marine life under the sea. My instructor Dhirendra was quite cooperative and guided me right into the deep blue waters. As I swam into the deep waters, I couldn’t believe my eyes; I felt I was in a different world all together. 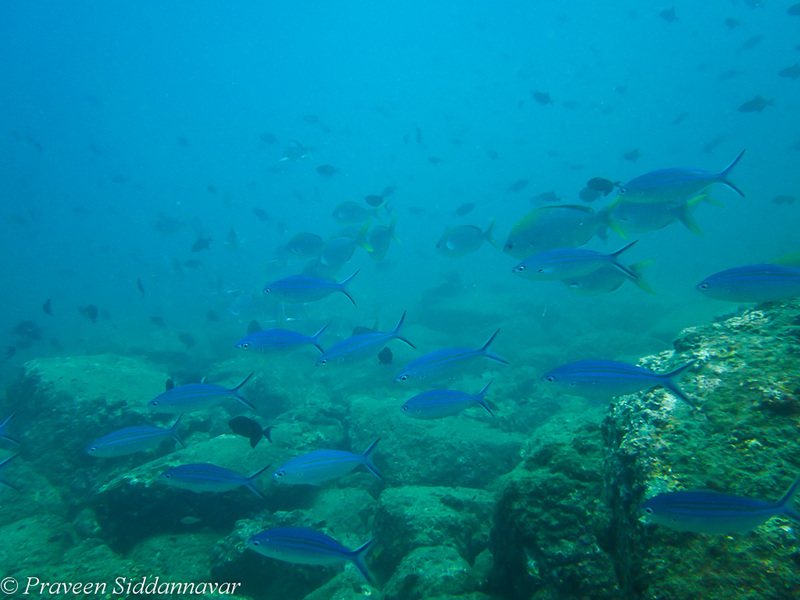 I was surrounded by beautiful and colorful small fishes, they aren’t harmful watching them was a treat to my eyes. After a while my instructor asked me if I was ok, since we can’t talk all signals are done by hand. 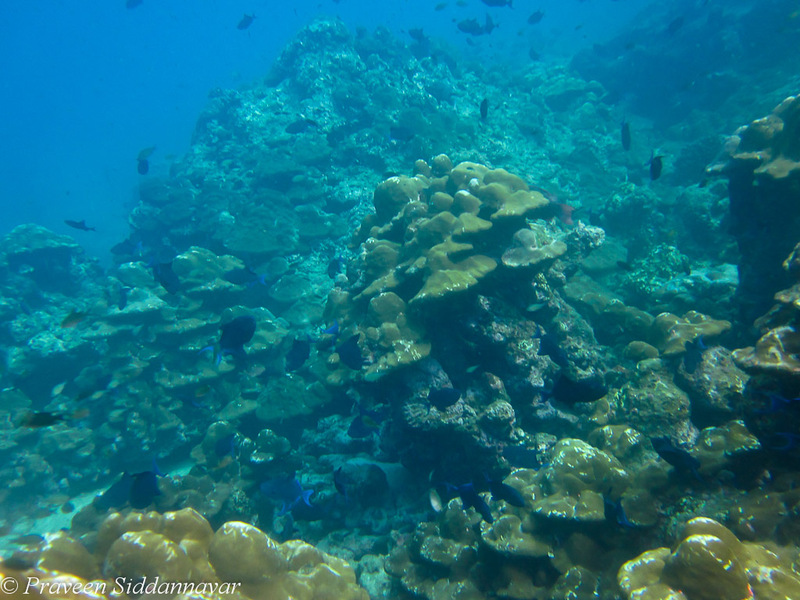 I responded him that I am ok he then guided me further down and believe me I hadn’t seen live corals before. 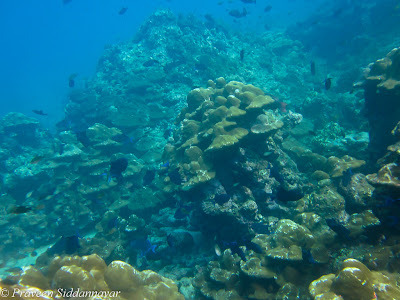 This was amazing stuff to see different kinds of corals. Having been used to forest so much on bumpy jeep rides and sighting tigers, this was some experience, to my luck I also sighted a large shark at a distance. Later I was even excited to see few lobsters & large shrimps my mouth was watering seeing themJ, quite obvious for a seafood lover like me. My instructor was taking my pictures and also filming, he then handed over the camera to me, it was an experience of my life to take few shots underwater. After about 20-30 minutes I was out and really exhausted, but believe me if you haven’t experienced Scuba Diving then you surely are missing something in life. I have uploaded a video clip on face book, kindly click the link to watch it. 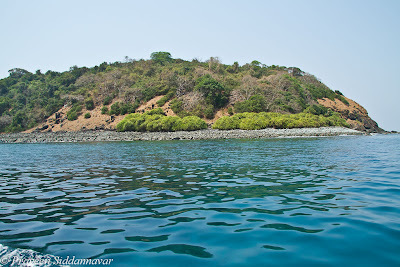 Netrani is a tiny island is located in the Arabian Sea. 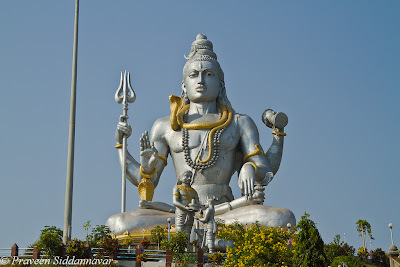 It is off the coast of Karnataka, situated approximately 10 nautical miles (19 km) from the temple town of Murudeshwara. 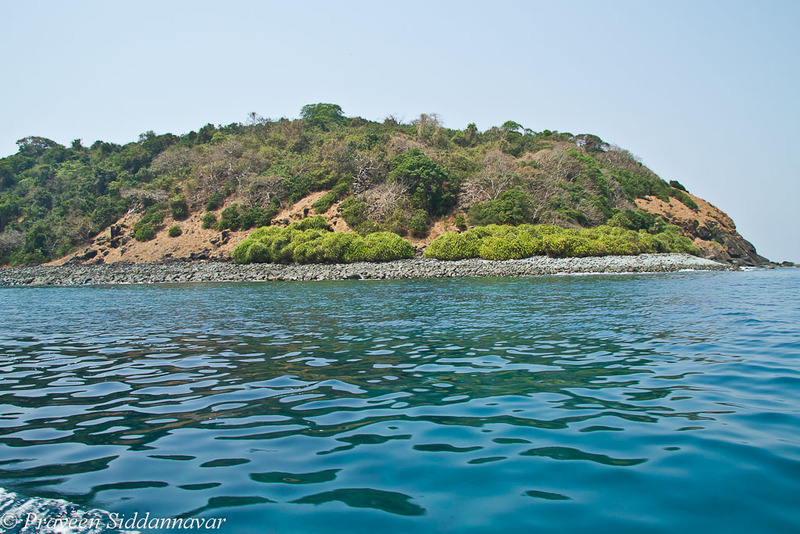 This Island has some of the best sites for Scuba Diving easily accessible from Goa, Mumbai or Bangalore. 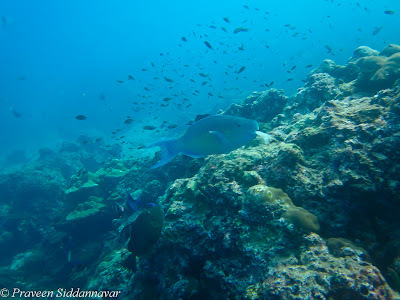 Netrani is a coral island and, therefore, is very suitable for snorkeling and diving activities. 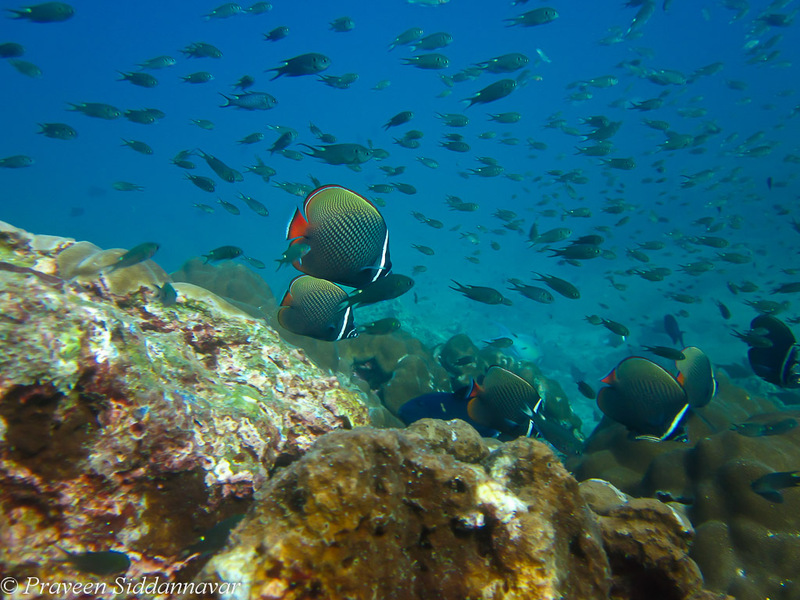 Many varieties of Corals, Butterfly fish, Trigger fish, Parrot fish and more can be seen here. In addition Whales and Sharks are seen if you are really lucky. Normally diving/snorkeling is done from a boat which is anchored close to the island and usually visitors do not climb on to the island because of the sharp rocks and steep cliffs on the island. This island offers diving suitable for professionals. The island adjacent to Netrani is used by the Indian navy for target practice. 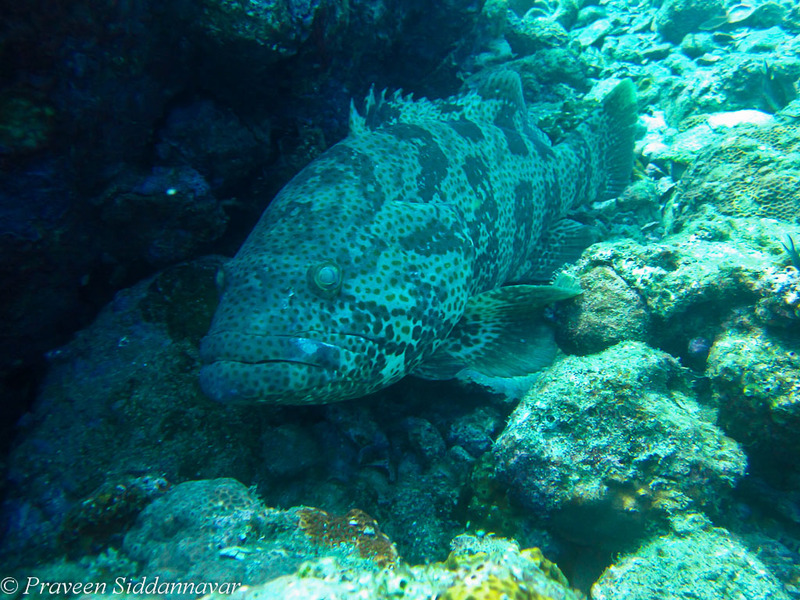 One needs to seek permission from Police Dept to visit and do Scuba Diving at Netrani Island. The best time to visit is between December and January. But how much the trip costs per person and what is best time to visit this place ? Wonderful experience, thanks for sharing this informative information with us. An excellent read. This is Subhrajit from www.adventureclicknblog.com and we would love to have your blogs listed in our website. We are trying to capture all the adventure blogs at one place.We have also launched a credit system for contributions by which contributors can reimburse the points for cool travel stuffs (adventureclicknblog.com/moreblognearn.php). The credit points are a way of saying thank you for your sincere effort and time for writing. Good to see this post i will tell my friends circle about this post. Wow!!! Great experience. Actually me and my whole family planning to go again for scuba diving. I love adventurous trips and my kids too:) and good job and great efforts. I found it very interesting and enjoyed lot …keep it up, lovely job. Thanks to sea water sports for giving me and my family amazing experience. It was an excellent trip with sea water sports, DudhSagar waterfall visit was one of the best memorable trips of my life. The natural beauty and white (milk) waterfall were the best. It was an awesome experience. Thank u sea water sports.